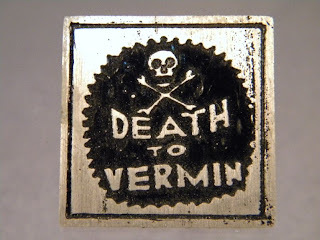 Someone gave me this image, copied from some old insect/rodent poison canister. 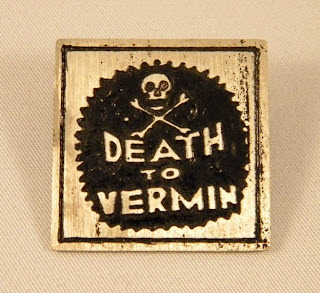 I like the crude nature of it and the incredibly appropriate nature of the message. 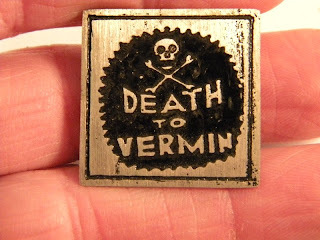 Bad boss, politicians, relationship, or whatever, "Death to Vermin" really 'kinda covers it all pretty well. I have one on my briefcase. I also made this into shirts. I silk screened red ink onto black t shirts, it looked good, I don't think I have anymore of those left. Which is weird, because I sure I made over 3 dozen of them( I can remember the box) and that means a bunch of people bought them and are wearing them around. They looked pretty crazed, as I recall. I've resisted the urge to clean up the image, it looks good the way it is, I just photo copied it from the box of poison, and did the necessary photo etching work to make it happen on nickel silver. It's $20.00, shipping is included and it comes in a small gift bag.